I am really loving the coral and teals coming around for the spring, but I also love the bright yellows and oranges of Spring and Summer. I got to visit the "King of Prussia" mall last weekend for the first time and I noticed a lot of bright colors in accesories and in clothing. Seeing these colors, I'm getting more excited to swap my black and brown winter clothes for bright rompers and sundresses. Every time I come here I want to go shopping! haha Love it! love all this color, such a lovely blog! so many great colors! i love bright colors!!! I'm drooling over that watch you profiled here - wow! I love the coral and the teal! So bright and beautiful. Sarah-Those are two of my favorites! Im glad you all are liking this! I love block colors, they're a big trend this summer! my fav color are the ELECTRIC ones! =) adore all of these! coral tones in the warmer months make me soo happy! I am excited to bring out coral nailpolishes soon to hurry spring up! love all those colours. great post. 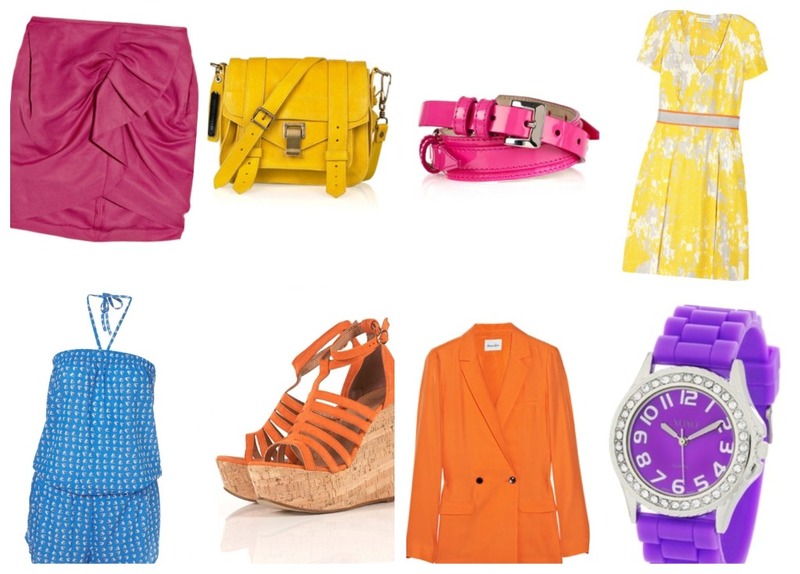 I am loving these bright colors! Seriously awesome and making me get in the mood for some sunshine!